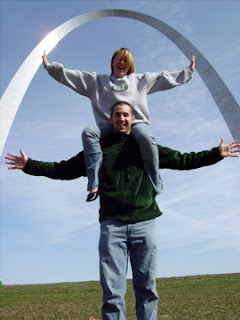 My sister-in-law, Stacy (Matt's sister) is hanging out with us in St. Louis for her (and Matt's) Spring Break! We are showing her the sights and taking her to do some of the fun FREE things to do. First we went and took the Budweiser tour (pictures below), and then we went to the arch. Everyone who comes to visit has to see the arch! 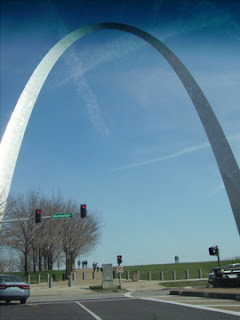 What would coming to St. Louis be without going to the arch? After all it is the 'Gateway to the West". 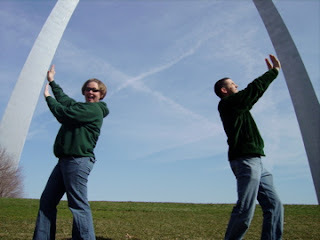 Anyway here are some fun pictures of our time at the arch. We had a blast trying to get creative with our cameras. Look how strong we are! Look how strong they are! 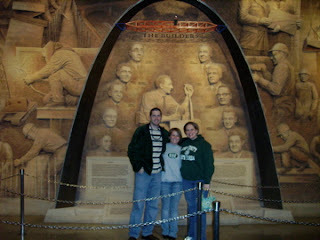 This picture is taken in the museum underneath the arch...we're so cute! Hey Matt and Emily! Love your blog--love you both more! Thanks Nikki...we love you guys too!